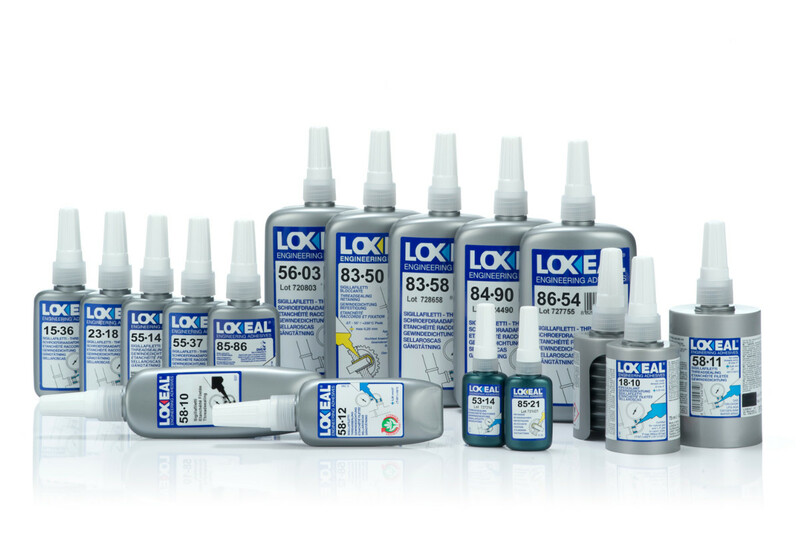 Threadsealing Anaerobic Adhesives | Loxeal S.r.l. Threadsealings guarantee hydraulic tightness of the threaded connections. Many Loxeal Threadsealings are certified according to various international standards for potable water, gas and oxygen. They are available in various grades of locking strength in order to achieve any performance required. Anaerobic sealant for thread connections allowing easy dismantling of parts. DIN-DVGW approved for gas (Reg. nr. NG 5146AT0263). Upon curing will give an elastic film to replace yarn, PTFE tapes, and solid gaskets for the sealing of gas, air, water, LPG, oils, hydrocarbons and many chemicals. Easy to dismantle. Shocks and vibrations resistant, it will keep unaffected properties of sealing in the range of temperature from -55°C to +180°C. Anaerobic adhesive for sealing of metal thread pipe joints. Suitable for gas, LP gas, compressed air, gasoline and oil, industrial fluids, CFC, water and several chemicals. Low friction coefficient will assure easy assembly. Thixotropic property prevents migration from thread of the sealant before or during curing. It replaces PTFE tape and yarn. Cured product provides elastic film. Shocks and vibrations resistant; unaffected sealing properties in the temperature range from -55 to +150°C. Easy dismantling is assured even after years. Approvals for natural gas and LP gas in vapour state. Europe: approved to EN751-1 by DIN-DVGW NG 5146AR0574 from -20°C to +150° C up to 2” pipe size. Australia: approved by AGA n.5047 up to 5 bar and 2” pipe size. Low strength anaerobic adhesive for thread locking of nuts, bolts and screws of all types that require to be easily dismantled. Also to seal thread joint up to 3/4″. Highly resistant to thermal shocks, corrosion, vibrations, water, gases, oils, hydrocarand many chemicals. Medium strength anaerobic adhesive for sealing hydraulic and pneumatic threads connectors up to ¾” and small pipes. To replace PTFE tapes in the sealing of gases, water, LPG, hydrocarbons, oils and other chemicals. Approved for Gas according to European norm EN 751-1 (DIN-DVGW NG-5146AU0038). Highly resistant to heat, corrosion, shocks and vibrations. Medium strength anaerobic adhesive for sealing hydraulic and pneumatics threads connectors up to 1″1/2. To replace PTFE tapes in the sealing of gases, water, LPG, hydrocarbons, oils and other chemicals. Medium thixotropic effect prevents migration of the sealant before or during curing. Highly resistant to heat, corrosion, shocks and vibrations. Medium strength anaerobic sealant for threads connectors up to 1″1/2. To be used in the sealing of gases, water, LPG, hydrocarbons, oils and other chemicals. Cured sealant forms elastic films highly resistant to vibrations and shocks. Retains sealant properties up to +150°C. DIN-DVGW approved thread sealant for gas according to DIN EN 751-1 – Registration Number NG 5146AS0302. Medium strength anaerobic adhesive for sealing hydraulic and pneumatics threads connectors up to 2″. To replace P.T.F.E. tapes in the sealing of gases, water, LPG, hydrocarbons, oils and other chemicals. Medium thixotropic effect prevents migration of the sealant before or during curing. Highly resistant to heat, corrosion, shocks and vibrations. Anaerobic adhesive, fast curing, medium strength threadsealant for metal joints. It replaces PTFE tape and yarn. It contains polymeric additives with low friction coefficient simplifying the spin of threaded joints. It provides instant sealing against low pressure or against high pressure within one hour. It seals against gas, air, water, LPG, hydrocarbons, oils and many chemicals, including refrigerants. Pasty consistency avoids dripping during application and curing. provides a flexible cured film, which is heat and vibrations resistant in the temperature range from -55°C to +150°C. Approved for gas – Gaz de France. Anaerobic curing adhesive for sealing of metal thread joints only. Approved for Gas (DVGW, DIN-EN 751-1), high pressure gas and GLP (Australian Gas Association – Approval No. 5048) for working pressure up to 20 Bars. Approved for use with gaseous oxygen up to 10 Bars and +60°C (BAM Ref. N° II-717/2007 E). WRAS listed for contact with wholesome (potable) water, approval number 1310513. Approved for contact with drinking water (GLOBAL MARK, GM-WM-040164-I01-R00). NSF registered in cat. P1(n. 141234) as acceptable for use as a sealant in and around food processing area. It replaces PTFE tape and yarn and gives instant sealing against moderate pressure. It seals against gas, water, LPG, hydrocarbons, oils and other chemicals. Thixotropic property prevents migration of sealant from thread before or during curing. Shock and vibrations resistant, sealing properties unaffected over the temperature range from -55°C to +150°C. Anaerobic curing adhesive for sealing of metal thread joints. Appropriate to seal against gas, water, LPG, hydrocarbons, oils, CFC and other chemicals. Designed to improve the operating conditions, they are not labelled as hazardous products, according to actual directive on dangerous products, it is labeled as not hazardous. Thixotropic property prevents migration from thread of the sealant before or during curing. Shocks and vibrations resistant, keeps unaffected sealing properties in the temperature range from -50 to +150°C. Fast curing high strength anaerobic adhesive for locking and sealing threads, and retaining of cylindrical components. Highly resistant to heat, corrosion, vibrations, water, gases, oils, hydrocarand many chemicals. Very fast curing, high strength anaerobic adhesive for locking threads and retaining od cylindrical components. Suitable for curing on passive metal surfaces, zinchromated steel and stainless steel without activator. Highly resistant to heat, corrosion, vibrations, water, gases, oils, hydrocar¬bons, and many chemicals. Fast curing anaerobic adhesive for metals, with high mechanical resistance, designed to seal and lock threaded joints and cylindrical couplings. Provides high resistance to temperature, vibration, chemical agents and aging. Highly resistant to unscrewing on yellow brass, nickel-plated and chromed fittings. Approved as threaded joints sealant for gas pipes under EN 751-1 (DIN DVGW nr. NG-5146BQ0134). Suitable for use with hot and cold potable water up to +85°C (WRAS-approved material BS6920:2000). Positively tested by NSF Laboratoires, Michigan, USA, according to ANSI 61 for potable water contact. Keeps the sealing property until the temperature of +200° C for short periods. High strength anaerobic adhesive for locking and sealing thread connections. Specifically developed to obtain maximum of torque strength on brass. Highly resistant to heat, corrosion, vibrations, water, gases, oils, hydrocarand many chemicals. Anaerobic adhesive specific for high mechanical strength on yellow brass, to seal threaded joints and to fix cylindrical couplings. It keeps sealing properties up to +250°C. It’s highly resistant to thermal shocks, vibrations, chemical agents and aging. Its high viscosity allows a great handling tolerance. Fast curing high strength anaerobic adhesive for locking and sealing threads, and retaining of cylindrical parts. It allows larger machining tolerances. Highly resistant to heat, corrosion, vibrations, water, gases, oils, hydrocar¬bons, and many chemicals. Approved for gas – Gaz de France. Anaerobic adhesive for metals, high strength, to lock and seal threaded joints. Approved for use with drinking water according to TZW-DVGW approved for gas-tight threaded joints according to EN 751-1 (DIN DVGW approval no. 5146AR0573-NG). WRAS approved for contact with wholesome (potable) water; Approval N° 1505512. The product is certified (BAM-Berlin) for use as sealant in the presence of gaseous oxygen up to 20 bar at +60°C.Can be used on all metals, both in free or forced matings. Maintains the sealing properties up to +200°C. High resistance to thermal shock, vibration, water, gas, oils, fuels, refrigerant fluids and other chemicals. High strength anaerobic adhesive for locking and sealing thread connections and fitted parts. High viscosity and thixotropic effect allow larger tolerances. Highly resistant to heat, corrosion, vibrations, water, gases, oils, hydrocarand many chemicals.